Heart disease, cancer, and diabetes don’t care in what month you were born. The latest Columbia University report claims the month you were born decides to what disease you’re predisposed. This is a bit hokey. Their figures are probably accurate when it comes to winter and vitamin D deficiencies, but overall it alludes to the idea that we are predisposed to disease, and it is beyond our control. The recently released John Hopkins study that suggests unlucky people get cancer is laughable. The medical establishment and media will say almost anything to have us believe that it is not within our power to avoid disease. There are few genetic issues we cannot escape, but almost all disease is self-induced. One of the first things I subscribe to is the belief that, as an adult, whatever we consume is our choice – from food and beverages to information and thoughts. For years, I was oblivious to just how poorly I was supplying my body with nutrients. Day after day I was filling it with toxins and “food” void of almost all nutrition. How it is I am alive and in as good health as I am, is a testament to our body’s ability to endure. Our bodies ability to heal is greater than most of us have been taught. When it comes to nutritious food, I have a shot wheatgrass juice at one end of the food spectrum and on the opposite end I have a shot of Crisco. Wheatgrass is full of energy, minerals, chlorophyll, and enzymes. It nourishes our bodies and promotes wellness. Crisco, on the other hand, is essentially toxins that can likely only promote illness (hydrogenated GMO soy and palm oils and TBHQ, which is a form of butane). 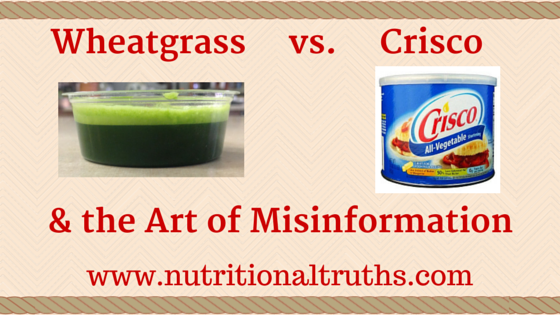 Choose foods that are closer to wheatgrass than to Crisco. Be aware you are choosing your fate. Your health outcomes are not just some predetermined thing over which you are powerless. By making choices closer to wheatgrass, you can ensure healthier outcomes and less disease. The book, Nutritional Truths, and this blog have been written to ensure folks like you know the truth: you, more often than not, have the ability to create wellness. Kindly consider sharing this on social media and help me spread the word. I am heading into the studio next week to record the audio version of Nutritional Truths; by month’s end the audio version will be available on iTunes. Thanks for your time and Be Well!